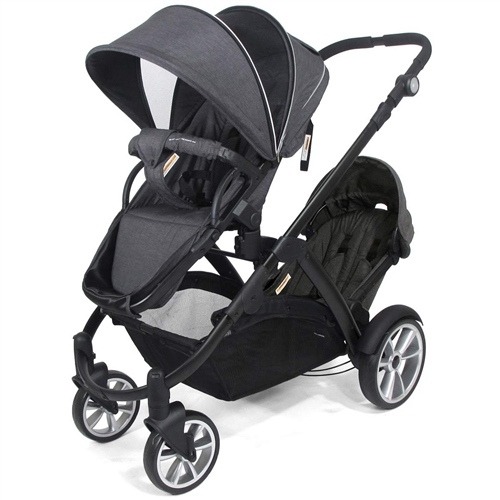 Straight out of the box, the Icon X2 can be used as either a single or twin pushchair, suitable from 6 months. The upper seat unit, which can either be placed in a forward or parent facing position, features multiple recline positions and a 5-point padded safety harness. This ensures a comfortable and secure seating position. The large retractable hood gives sufficient coverage for your child in the upper seat position from harmful sun rays, whilst still providing a comfortable environment in which to sit thanks to its breathable zipped mesh panel. The hood also features a small viewing window in the upper section with a fabric covering when not in use. The upper seat also features a crotch strap and a removable bumper bar to which it fastens. The lower tandem seat unit is adjustable to two recline positions, includes a safety harness and its own retractable hood as well. The lower seat is further protected by two wheel guards either side of the frame. Whilst the children are comfortable in their new pushchair environment, parents will appreciate the additional features the Icon X2 has to offer. An adjustable height handlebar with soft grip means that whoever uses the pram, they’ll be able to adapt it to a comfortable pushing position. A large shopping basket underneath the main seat unit provides ample space to bring along all your baby essentials, leaving your hands free to do all the pushing. Additional convenience and safety highlights include a foot operate brake pedal when your pushchair is parked, integral reflectors on the side of the chassis to help remain visible in low light conditions, lockable front swivel wheels when you want to make the transition from nimble manoeuvring to straightforward, streamlined strolling and a PVC rain cover large enough to cover the twin pushchair and protect your children from the elements. I love love love this buggy! It’s so easy to use! It’s large but not obnoxiously, it is easy to get around, I only have one baby at the minute and the buggy is still as useful, huge section for storage which is amazing! And actually looks normal without the second seat, Highly recommend! Prob the best pushchair I’ve owned and I’m on baby 4!! Great as a single and as a double.. actually had it as a newborn pram when my toddler was 14 mths I just put a soft cosy toes inside the top seat and it was perfect! So easy to fold I was amazed and easy cleaning too.. fits on the bus even if both seats are led down and now they are 9 and 22 months they are both still happy to be in it.. for the price I’d recommend it fully if you don’t want to spend a bomb but want a slim double .. overly happy customer.. only downfall is the fabric on the hoods isn’t overly thick so be careful of scagging it!! Great light pushchair. Easy to push.